Arnason, H. Harvard. History of modern art: Painting, Sculpture, Architecture. 3rd edition revised and updated by Daniel Wheeler. New York: Abrams, 1986. Standard, well-respected textbook on the movements and styles of twentieth-century art. Chronologically/ thematically arranged chapters begin with prehistory of modern painting, realism and impressionism, post-impressionism, art nouveau, Fauvism, and Expressionism, and end with sixties abstraction, the post-minimal seventies and the pluralistic seventies, the neo-expressionism and neo-abstractionism of the eighties, and post-modernism in architecture. Sawyer Library's 2004 edition may also include the art of the nineties. Foster, Hal, Rosiland Kraus, and Yves-Alain Bois. Art Since 1900: Modernism, Antimodernism, Postmodernism. London: Thames & Hudson, 2004. A controversial but important book in the field. Arranged as a year-by-year chronology from 1900 to 2003. Janson, H. W., and Anthony F. Janson. History of Art, 6th edition. New York: Harry N. Abrams, 2001. Minor, Vernon Hyde. Art History's History. Upper Saddle River, NJ: Prentice-Hall, 2001. Three main sections trace the development of art history as a discipline, from ancient theories of art (e.g. Plato and Aristotle) through medieval and Renaissance theory, nature and the ideal in 17th century theory, and the emergence of method and modernism in art history from Winckelmann to late-twentieth-century intertextuality (including among other things Marxism, feminism, deconstruction, psychoanalysis, and "the other"). Nelson, Robert S., and Richard Schiff, editors. Critical Terms for Art History. Chicago: University of Chicago Press, 2003. The best handbook of its kind, with lengthy essays (each with a substantial bibliography) on such terms/concepts as representation, sign, word and image, narrative, meaning and interpretation, avant-garde, body, gaze, gender, ritual, identity, postmodernism and postcolonialism, and visual culture/visual studies. Pointon, Marcia R. History of Art: A Student’s Handbook. London: Routledge, 1997. Preziosi, Donald, editor. The Art of Art History: A Critical Anthology. Oxford: Oxford University Press, 2009. “The meatiest of the art history anthologies,” with selected readings on the art-historiography of art as history, aesthetics, style, history as an art, iconography and semiology, modernity, gendering, deconstruction and the limits of interpretation, and “the other: art history and/as museology.” Each section has a substantial critical introduction, and each essay has bibliographic notes. Vaughn, William. Arts of the 19th Century, Volume One: 1780 to 1850. Translated from the French by James Underwood. New York: Harry N. Abrams, 1998. Cachin, Francoise. Arts of the 19th Century, Volume Two: 1850 to 1905. New York: Harry N. Abrams, 1998. Documents the innovations and discoveries of the turbulent years of the 19th century, and the flowering of the arts (painting, sculpture, graphic arts, decorative arts, and architecture and planning) that resulted. The book is not a social history of art, nor is it merely or only an aesthetic evaluation; it is “an attempt to illustrate and shed light on the variety, profusion, and inexhaustible fecundity” of art from 1780 to 1905. Lavishly illustrated. Includes short biographies of important 19th-century figures (not just artists) and a bibliography. Barasch, Moshe. Modern Theories of Art, 1: From Winckelman to Baudelaire. New York: New York University Press, 1990. ———. Modern Theories of Art, 2: From Impressionism to Kandinsky. New York: New York University Press, 1998. Lucid survey of modern theories of art. Thematic arrangement: the early 18th century, the beginnings of the new age, unity and diversity of the visual arts, the symbol, the artist (Volume 1) and impressionism, empathy, discovering the primitive, and abstract art (Volume 2). Bibliographical essays on pages 391-407 (Volume 1) and pages 371-381 (Volume 2). ———. Theories of Art: From Plato to Winckelman. New York: New York University Press, 1985. Introductory survey of the major stages in the development of European art theory, through the early 18th century. Sections on antiquity, the Middle Ages, the early Renaissance, the late Renaissance, and Classicism and the Academy. Harrison, Charles, Paul Wood, and Jason Gaiger, editors. Art in Theory 1648-1815: An Anthology of Changing Ideas. Oxford, UK; Malden, MA: Blackwell Publishers, 2000. –––– . Art in Theory, 1815-1900: An Anthology of Changing Ideas. Oxford, UK: Malden, MA: Blackwell Publishers, 2001. Harrison, Charles, and Paul Wood, editors. Art in Theory, 1900-2000 an Anthology of Changing Ideas. Malden, MA: Blackwell Publishers, 2003. Anthologies of abridged texts provide students of art, art history, and aesthetics with "a substantial and representative collection of texts, drawn from a wide variety of sources" that together provide an overview of the development of art and art theory during the modern period. Many texts are difficult to find elsewhere or have not previously been translated into English. Smith, Paul, and Carolyn Wilde. A Companion to Art Theory. London: Blackwell, 2002. Essays by eminent scholars on theories of Western art, beginning with the roots of modern art theory in Renaissance Italy and extending, roughly chronologically, to 20th-century theoretical themes. Includes sections on tradition and the academy, modernism, critical theory and postmodernism, and interpretive theory. Does not cover visual culture, feminist theory, or film and photographic theory. Scroll up to find historical guides to art and art history, and surveys of art theory. Arntzen, Etta, and Robert Rainwater. Guide to the Literature of Art History. Chicago: American Library Association, 1980. Landmark bibliography of reference and basic research resources in the field of art history; a classified listing of bibliographies, directories, periodicals, auction sales material, visual resources, dictionaries and encyclopedias, iconography, historiography, sources and documents, histories and handbooks, and key resources in “the particular arts” i.e. architecture, sculpture, drawings, painting, prints, photography, and the decorative arts. See also Marmor & Ross’ GLAH2, below, which continues but does not supercede GLAH1. Marmor, Max, and Alex Ross. Guide to the Literature of Art History 2. Chicago: American Library Association, 2005. Continues but does not supercede Arntzen & Rainwater’s GLAH1, above, and follows the same classified organization of reference and research resources in art history. Includes some electronic databases but does not include websites. Ammi Phillips. 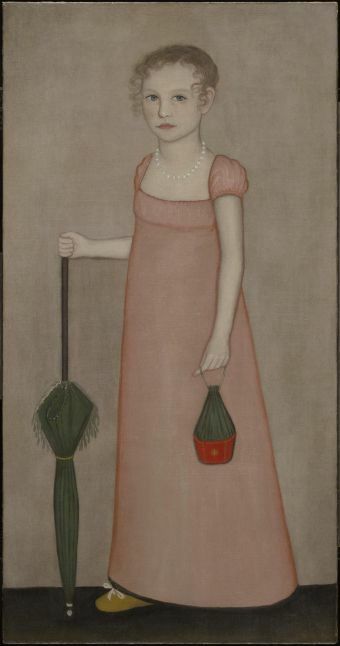 Portrait of Harriet Campbell, 1815. Oil on canvas. Sterling and Francine Clark Art Institute, Williamstown, MA.